Kojima Productions and Konami have confirmed that recent magazine scans of a Metal Gear Solid game being played on an iPhone were indeed real. This new app. for iPhone is reportedly a touch screen only game whose story focuses on the characters found in Metal Gear Solid 4: Guns of the Patriots. 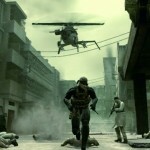 Fans of the Metal Gear Solid franchise (especially fans of MGS4: Guns of the Patriots) are no doubt aware of Kojima Productions’ support of Apple — Mac computers and iPods were seen throughout the latest installment of the series. Details on plot and gameplay are scarce at the moment. However, Konami has reported that the app. will be released with eight playable levels – with more to come via downloadable updates. With reports that the iPhone has graphical capabilities comparable to the PlayStation 2, fans are now overwhelmed with anticipation over what promises to be an exciting, portable addition to the Metal Gear Solid Franchise.